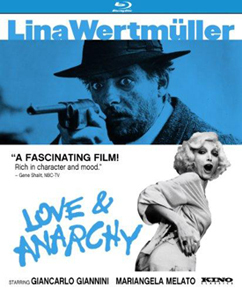 Read my review of two Lina Wertmüller films, LOVE & ANARCHY and ALL SCREWED UP, out now on Blu-ray from Kino Lorber, on The House Next Door, the official blog of Slant Magazine. This entry was posted in film, movie reviews and tagged all screwed up, blu-ray, giancarlo giannini, kino lorber, lina wertmuller, love & anarchy, mariangela melato, slant magazine, the house next door. Bookmark the permalink.